The forecast 20 to 30 knots did not eventuate. A few storms were passing out to sea, but not much wind at 4 mile so the downwinder did not eventuate. I visited the supermarket for more supplies, admiring the fruit bat colony hanging over the bike path on the way there. Stocked up with some friut, crumpets and muffins. Visited the the beach later in the morning. Brett turned up and went into town so I caught a lift into town. Updated my blog and Facebook and checked my email at the Wicked Ice Cream Internet cafe. The mango and lemon gelati was excellent. We grabbed a coffee then headed back to 4 mile. Brett dropped my at the corner cafe where I finished my Internet activities then headed back to Doug's for a light lunch. Back to the beach at about 2:30. 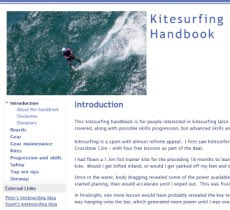 Chatted to a local about GPS units and software for kiting. He recommended and NAVI GTR. The wind sprang up so I setup my kite, then it fizzed. Chatted to Tomas about progressions. Brett recommends a downward kite turn. Tomas said it is a more powerful turn and you have to make the turn tight. He also said that a kiteloop when jumping is good, and to pull the loop just after the apex of a jump. The wind picked up a little so I headed out. Not much power so I had to fly the kite and ended up a few hundred meters down the beach after a few tacks. Walking back the wind picked up a little and a storm front was approaching so I headed out. The storm hit and the wind lifted to 25+ knots which gave me plenty of power and upwind direction. I was stretching out to hold the bar so I ended up de powering the kite which then made it quite manageable. I was a bit nervous about having the 14 lit up, but it was good to fly. There were two others out. We were really moving in the wind and rain. I turned on my helmet cam half way through, having now got the hang of using the controls when in motion. Two beeps for on, 1 beep for recording, 2 beeps for stop recording, and 2 beeps for power off. No problems going up wind, and the jumping was not a problem. I was surprised that I didn't jump higher considering the strength of the wind. The wind dropped after about an hour so I came in and packed up in the rain then headed back to the unit for a rest and a snack. Brett called to advise the downwinder from 4 mile to Cape Kimberley was on again for tomorrow with the boat arranged. His father Peter will be the skipper. The forecast is for 30 knots again so I am faced with a dilemma about which kite to take. In theory the 12m Crossbow would be ideal, but the bar pressure is a worry. The 14m Switchblade is much better if the wind drops and is also good for going downwind. De powered, it is quite manageable. My hands get sore after an hour of kiting, my right hand in particular goes a bit numb. Gloves don't seem to prevent this. This could be a limiting factor for long downwinders. Cookie said he is going for a bike ride up the hill tomorrow so I may go along if it is not raining. My stay here is nearly over. It has been worth having enough time to wait for good kiting opportunities and try different options. My kiting has exceeded expectations.